UTF NOTE: This story seems to be picking up steam almost two weeks after I reported it. Probably because the anti-LGBT folks in New Hampshire's legislature are trying to make a big stink over Maine and are hoping to continue the trend by rolling back LGBT rights in their own state. The Eagle-Tribune has the story that's now causing the new stir. They will not give up until we have no rights at all. Lawmakers in New Hampshire, inspired by Maine, are gearing up to put the state's new marriage equality law up to a popular test. Now that gay marriage has been defeated in Maine, attention again shifts to New Hampshire, where lawmakers say momentum from Tuesday's vote may fuel legislation to repeal the state's law and give voters a say. Two proposals are being drafted in the N.H. House: One would repeal the law Gov. John Lynch signed in June and re-establish civil unions; the other is a constitutional amendment that would charge voters with deciding if "the state shall only recognize the union of one man and one woman as marriage." Only the proposed repeal would go to the governor's desk in order for it to become law. Constitutional amendments head straight to the voters for two-thirds support upon being passed by the same margin in the Legislature. Behind the repeal push in the House are Rep. Jordan Ulery, R-Hudson and four other bill sponsors. "The issue was brought forth against the will of the majority of people, by a minority of people who confuse the issue by saying it was an equal-rights issue," said Ulery, adding that opposing gay marriage "doesn't mean people are against gays or lesbians or whatever you want to call that group of individuals." People are free to live with whoever they want, he said, "just don't call it what is between my wife and myself who are raising children." Whatever you want to call that group? What the hell?! The other proposal, the constitutional amendment, is backed by Rep. Dan Itse, R-Fremont who believes that the legislature did not have the authority to redefine marriage. "Ideally, before legislators took action they should have sought permission from the public," he said. "The people are now in a position where they have to play defense and not offense." Uhm, they did. When they were elected. Are these people nuts? Rep. Jim Splaine, who sponsored the marriage equality bill disagrees with Itse, claiming legislators do have the authority because marriage laws fall under state government. "We have some legislators who don't think you can do anything under the constitution," he told Foster's Daily Democrat. Though both proposals face an uphill battle due to the fact that the make up of the legislature hasn't changed much since it passed marriage equality, it's a reminder that the opposition will stop at nothing to take LGBT rights away until we can't function in society. Or in other words, fail to exist to them at all. ACTION: If you live in New Hampshire, find out who you're legislator is here and then call and tell them to reject these proposals. And if you happen to be represented by any of the sponsors, GIVE 'EM HELL! To get more involved, go to New Hampshire Freedom to Marry Coalition. I wouldn't waste an action alert on this. It is just posturing by a few state legislators in the minority party. NH has no mechanism for a direct vote, so they couldn't do it even if they wanted to. 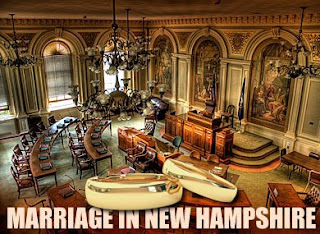 During the NH marriage debate, the most that was discussed was an advisory vote and that was rejected. There is absolutely no way that both houses of the legislature are going to vote to keep this issue alive when they have already passed it and moved on. I think you will see a lot of this in the coming months, attempts to use the Maine outcome as some sort of justification for every item on the anti-gay wish list. But it is just rhetoric. To my knowledge, there has not been a single state legislator in any state that has ever lost his or her seat over a gay marriage vote. Unless you are talking about the specific issue of marriage in a referendum state, Maine should have no impact. I agree it's rhetoric, but I always think it's important to put an action behind such attempts. Calling them and letting them know that their every move is being watched is key. The fact is, they're submitting proposals. It's important that they hear from constituents.